Direct selling tips to make more sales appointments with prospects at home by knowing what to say on your cold calls to move forward from the Introduction Stage and keep them listening to you. You’ve cold called your prospect to make a sales appointment. You’ve given a brief introduction of you and your product or company. You’ve presented your reason for calling the prospect, using a potential benefit, and the prospect is still listening. What do you do and say next to get the prospect to answer your sales questions and to keep their attention? At this point in your appointment call, after you have introduced you, your company, and your product, and given the reason why you are calling. And before you move into the Questions to Qualify the prospect as someone you want to meet. To move the prospect forward to the next stage of the call where you ask questions to qualify them as someone you want to meet with, a potential customer. 1. A reason to move forward and closer to receiving potential benefits. 2. A question to get the prospect responding. The next stage after this motivating line is the Qualifying Questions Stage where you qualify the prospect as a potential customer and someone you want to meet. The question in the Motivator is the first question of the next stage and smoothly links the Introduction Stage with the Qualifying Stage. The first part of your motivator is a simple line explaining why you are going to ask questions in the next stage of the call. So that I can ..... I need to ask you some questions, then ask the first question. But obviously you use your own words that suit your prospects and your marketplace, and add a potential benefit in the space. After saying, Let me ask you... you go straight into a question that starts your Qualifying Questions Stage. The question to tag onto the Part 1 line of your motivator. If the question used in the motivator is too strong, or too direct, the prospect will feel that a sales process has started. When this happens unless your reason for calling, in the Introduction Stage, really hits their needs they may resist moving forward and raise an objection. If the first question you ask is too open and sales-soft, the prospect may reply by taking the conversation way off track. Soft Motivator questions may not keep their attention and you lose their focus. The direct selling tips for making sales appointment calls on the rest of this page will show you how to select a question for your motivator that has the right level of strength and control. 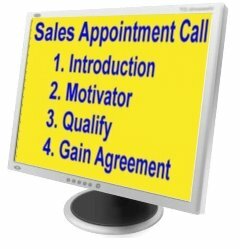 This page gives you sales training on creating a motivating line, which is stage 2 of the sales appointment call process. The diagram below gives a visual representation of where the motivator question can be on the scale of strength and control. For these direct selling tips to work consider the difference between a motivator you would use on a business to business call (B2B), and one you would use on a call to a direct sales prospect at home. For a business prospect the motivating line should use a smooth, sales-soft, question that uses benefits to motivate the listener to move with you to the Questioning Stage. A motivator high on the control–strength scale may frighten off a business prospect. A direct sales cold call to an end user at home may need a motivator question that is higher on the control-strength scale so it keeps their attention and lets you control the process. So I can see if our product could be of benefit to you, let me ask you how do you feel about... Add a subject relevant to the benefits your sales proposal can offer. The question is open and the prospect can choose how they answer. To understand these direct selling tips think of the type of motivating line in the example above as a sales soft motivator. It works for B2B calls and some direct sales cold calls. There is no strength or control applied to keep the prospect’s focus, so it may not be the most effective for all direct sales appointment calls. The sales-soft end of the scale works well where the prospect is likely to listen to the early part of your appointment setting call because they want to know more about the potential benefits that you've mentioned in the Introduction Stage. General direct selling tips say that motivating lines from the sales soft end of the scale work better if you sell for a well known and respected brand, or sell a recognised product, that is instantly known by the prospects you call. They also work well if the prospect may have strong negative views about their current situation, for example high fuel bills, motor insurance, or other costs. Motivators from the mid-range of the scale work if your apointmet calls are supported by a marketing campaign or as a follow up to an earlier contact. 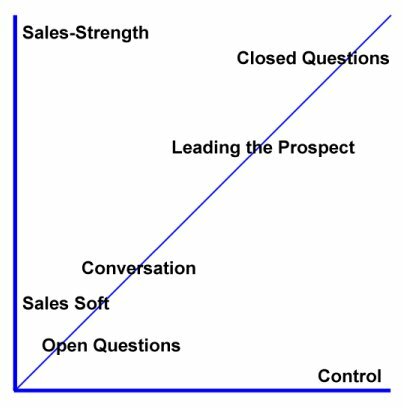 At the sales strength end of the scale we have motivators with closed questions that lead the prospect through a very controlled step from the Introduction Stage to the Qualifying Stage questions. The objective is to keep the full attention of the listener by asking a simple yes or no question that requires no thought. Whether they want to continue the call. What they were doing before the phone rang. This is a sales call. This is a complete stranger calling me and asking questions. And then you could get objections and rejections, and phones put down. The most controlling questions are usually closed, requiring a yes or no answer. An appointment maker may ask if others live at the address, if you own your own house, or if you are working. All closed questions. You own your own home, yes? The tagged on yes at the end is a strong direct selling tip and leads the prospect into a yes answer. This ‘yes’ response sets up the next question, which will be asked in the same controlling style, and before the prospect realises it they are into the Qualifying Stage of the sales appointment call. Using the above direct selling tips you can now visualise where on the Strength - Control scale your motivator should be. Think about the reactions you get when you make sales appointment calls. Do you get very early objections. Is your company or your product well known to them. Do prospects easily grasp the need that your products or services fulfil, or do you have to explain and convince them of the benefits. Use the points above to assess how much strength and control you need to have at this point in your calls. You can get more Direct Selling Tips on making sales appointment cold calls by using the same professional course that I use. Learn how to create a cold call script that has already been proven by sales people and appointment setters. See direct selling tips within the training. Half the course gives you sales training on how to make the calls using techniques used by professional cold callers.